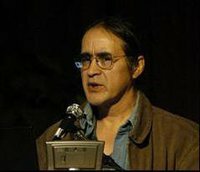 Orville Huntington is presently the Chair of the Interior Athabascan Tribal College. He also currently is serving as the Interior Villages Representative on the Alaska Federation of Natives Board for the 43 villages in the Doyon area, and makes his home in the Athabascan community of Huslia, a village in the Yukon-Koyukuk region of Alaska. This entry was posted in Make No Bones Shows and tagged Athabascan, Connecting with Spirit, Honoring, Human Rights, Indigenous, KAOS 89.3 FM, Make No Bones About It, Orville H. Huntington, Orville H. Huntington on Perspectives from the Arctic, Raven Redbone. Bookmark the permalink.